I have built and repaired the Buchla 248 MARF V1. 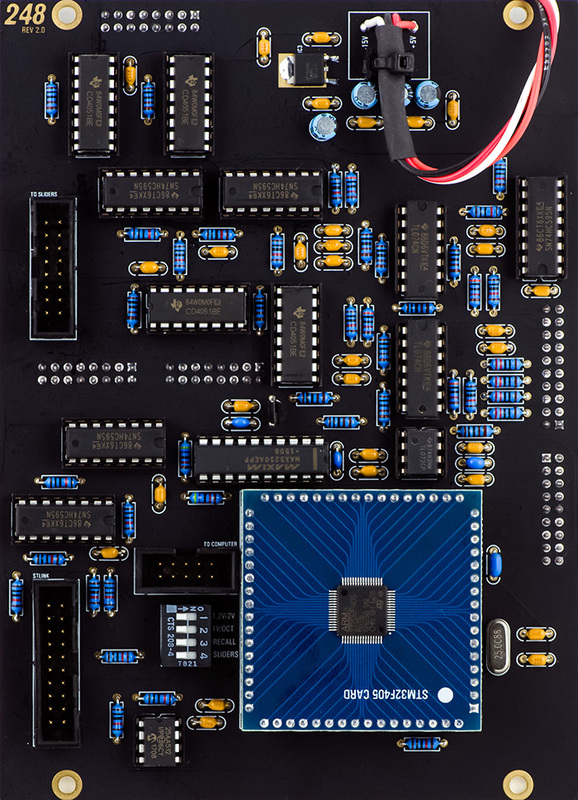 The module has been redesigned with a microprocessor and is quite complex. The build is fairly fast as only the panel components need to be assembled but V1.0 does require a number of SMT modifications. Programming and calibration is straightforward. The V1.0 PCBs have several SMT resistor and capacitor parts to be changed on the front and rear. The silk screen is difficult to read and I have helped several people repair their MARFs when they changed the wrong parts. These two reference diagrams highlight in color the required component to modify. Calibration is simple and fast. The Time Multiplier and Address controls may NOT work until you have performed this calibration. Don't panic if these controls don't work at first turn on. To calibrate the Time Multiplier and Address controls and the CV inputs turn all four controls fully CW. Hold the left Advance switch down while turning on the power. The green/yellow/red LEDs should begin to cycle. Release the Program 1 Advance switch. Apply 10.0V into all four external inputs. Then press the Program 2 Advance switch down. The LEDs will stop cycling and your controls and 10V inputs are now calibrated. Set the DIP switches for 2V/Octave. Set all the sliders to minimum. Program 1: Connect a DMM to the Voltage Output, set the Cont/Strobe to center, press the Display switch, Stop switch, Reset switch, and +0 limited switch. The DMM should now read some low mV voltage. Record this voltage for the next step. Press the +2 limited switch and adjust the front panel trimmer next to the Time Multiplier knob for 2.0 volts plus whatever the recorded low mV voltage was. Now check the accuracy at the +4, +6 and +8 settings. Readjust if necessary. You want the increment for the switches to be +2, +4, +6, or +8 volts. Program 2: Perform the same procedure with the Program 2 controls and outputs. V2 is designed on two PCBs with thru-hole parts. I made reference diagrams from the PCBs. 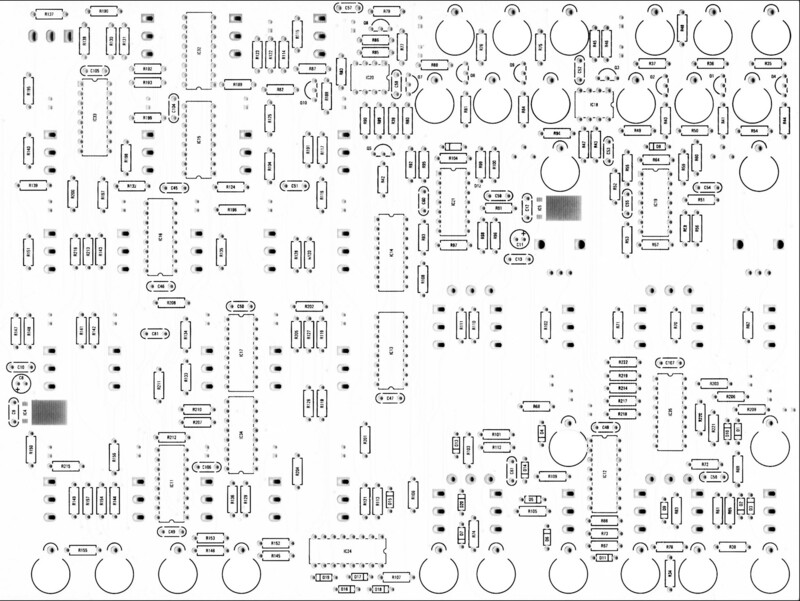 The silk screen reference numbers are way too small and it is hard to tell 3, 6, 8, and 9 apart in some areas on PCB1. I made a higher resolution image of just the component area to refer to when I couldn't read the silks screen. The BOM has several errors which I corrected. Here is PCB1 assembled without the LEDs installed. I added a 15mm FF and 12mm MF standoff in the mounting holes between the sliders and the circuitry to mount PCB2. There is not a panel hole for the 15mm but it will sit flush against the panel. The small dots near the switches indicates the momentary side. I installed about 6 switches at a time and then installed the panel and mounted it with two screws and a couple of switch nuts to line up the switches correctly before soldering. It took time but all the switches are correctly aligned. I have the potentiometers only soldered by one pin until I mount the panel. Once the potentiometer is fastened to the panel I reflow the one pin to relieve any stress. Then I solder the remaining pins. The flatted side of the LED silk screen indicates the cathode side of the LED. I install the LEDs but do not solder them until after the panel is installed. They I can push the LEDs flush with the panel and solder. I use the female board-to-board connector on the rear of the PCB with the power cable attached. That way if the power cable were connected there are no live male pins on the rear. This is typically the opposite of the BOM. Here is PCB2 with the ST Card installed. The power cable routes towards the PCB and interferes with the electrolytic capacitors (see below). Had I known this before I assembled the PCB I would have installed these three capacitors from the rear at right angles with their leads bend 90 degrees. The manual for the voltage scale DIP switches is wrong. For 2v/Oct scale slide DIP switches #2 & #3 #1 & #2 OFF. For 1.2V/Oct slide DIP switches #2 #2 ON and #3 #3 OFF. For 1V/Oct scale slide DIP switch #3 #2 ON position (switch #2 #1 is ignored). There are components under the ST Card on PCB2. The power cable isn't very well thought out. It routes into the row of electrolytic capacitors so if you tie strap the cable to the PCB it puts stress on the capacitors. One option is to mount the capacitors on the backside of the PCB. The spacing is very close so they might have to be mounted 90 degrees to the backside. I chose to make a standoff to raise the power cable over the capacitors. Here is the final assembled V2 from the rear. Programming is straightforward using ST Link. I have instructions for loading ST Link on my 218 page as they use the same STM32F505 processor. However, once programmed, the Time Multiplier and Stage Address controls and the Output Voltage Level sliders did not function. The build thread mentioned bad eeproms affecting the Time Multiplier and Stage Address controls. This doesn't make a lot of sense to me as the eeprom is directly interfaced to the ST32F405 processor and lack of data shouldn't affect reading the controls and sliders. I did buy additional eeproms in two different varieties and neither made any difference as I expected. I thought I would try reprogramming the firmware. However, once programmed, ST Link could no longer connect to the target. I don't understand why. Typically this would be due to the program redefining the SWDIO, SWCLK or SWO pins, but these pins are only used by the ST Link programmer so it doesn't make sense they would be reprogrammed. The various help files say to use a hardware reset but I could never detect ST Link driving the NRST line going low. I manually pulled it low and that made no difference. Finally I found one hint about pulling BOOT0 high. Boot0 is pin 60 and tied low through a 10K resistor. Vdd is pin 64 so I simply jumper the two while programming. Programming made no difference. I had verified my build so the last thing on the list was a bad etch. I started a the wiper of the Time Multiplier potentiometers and traced the signals back. 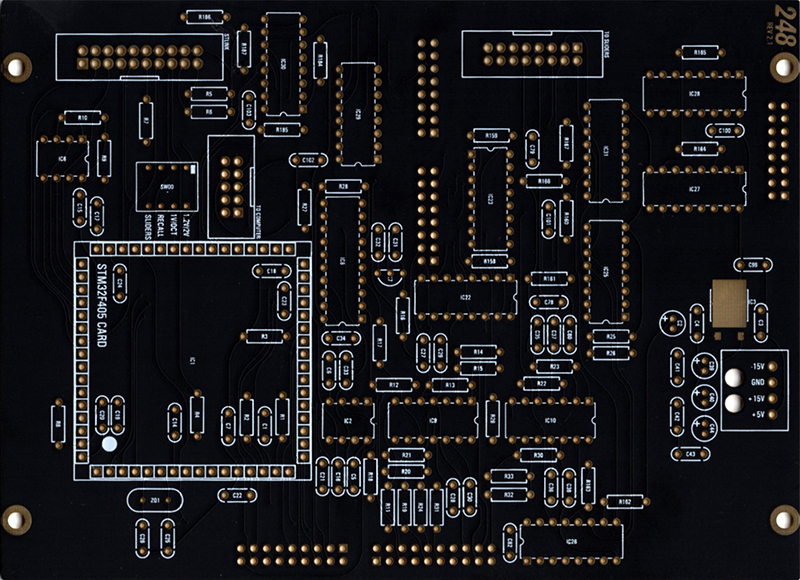 That was extremely difficult with these black solder masked PCBs (I don't know why designers use black solder mask other than to make sure their boards are unrepairable and destined for the trash heap). With enough diligence I found open runs on both PCBs. Jumpering them restored normal operation. I did not build this 248 Expansion but needed to verify it with the 248 V2 MARF. 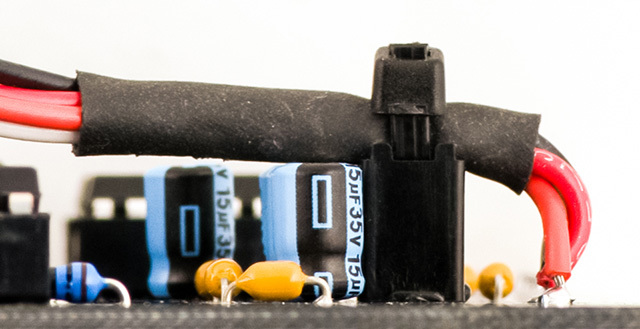 The sliders on the Expansion are powered from a reference supply through pin 9 on the expansion cable. This pin is unconnected on PCB2 so the Expansion sliders are unpowered. On V1 this reference supply is 5V and on V2 it is 3.3V. The logic on V2 PCB2 is also 3.3V so I jumpered IC31 pin 16 to To Slider IDC connector pin 9. I was never able to get the V1 Expansion working with the V2 MARF. The Voltage Level sliders worked correctly but the Interval Time sliders corrupted all analog data. 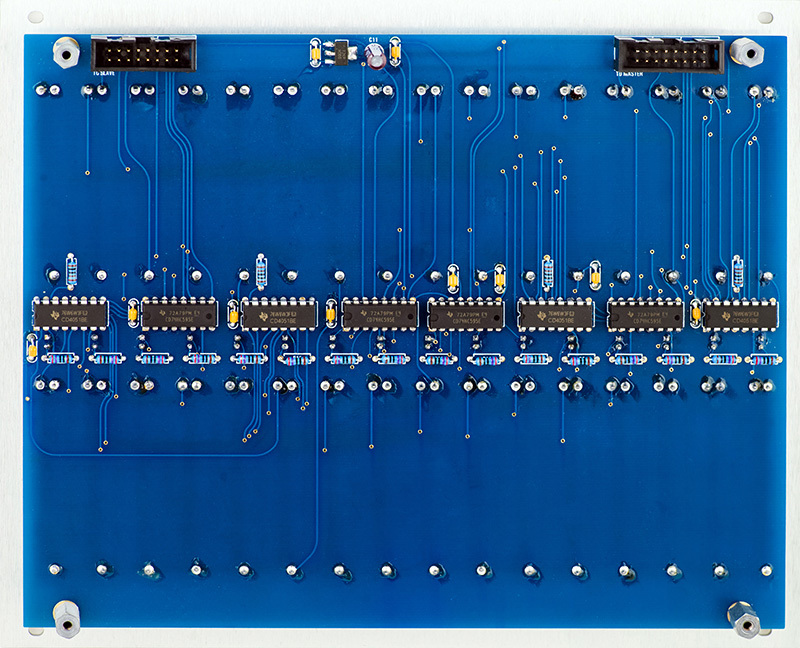 The processor reads the 68 analog controls using a series of 74HC595 shift registers which address CD4051 analog multiplexers. The last 74HC595 in the chain always has its last output, pin 7, low which enables the CD4051 to always have its data on the analog bus. If the sliders are lowered then it puts 0V on the bus through a 1K series resistor which attenuates the analog data by half. In addition, Time Interval sliders 17 and 25 seem to put their data on the analog bus at the wrong time, thus also corrupting the data. This serial data stream is asynchronous to the sequencer operation and has a lot of jitter which I suspect are delays caused by interrupts. Since there is a missing power run, a V1 Expander was never verified to work with a V2 MARF. I returned the unit to the customer with the belief that the firmware has issues. After I returned the module to the customer I found this on the ElectricMusicStore V1 Expander Order page. 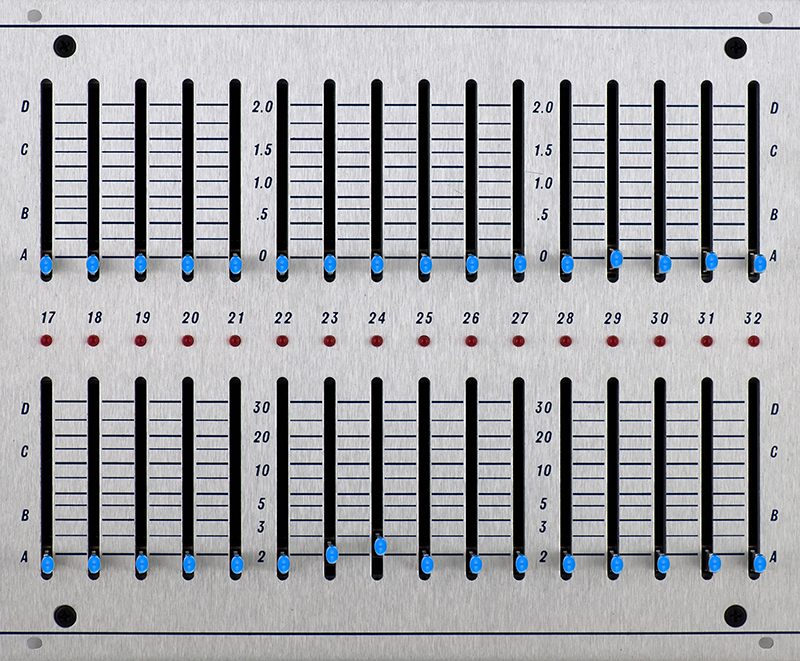 "This is an expander for the 248 Rev.1 (MARF Rev.1 SMT version). It is not working with the current firmware on the MARF Rev. 2 (thru-hole version). We are working to get it fixed ASAP." Even with the new firmware you will need to connect IC31 pin 16 to To Slider IDC connector pin 9 on the V2 PCB2. Also note that if you have programmed V2 with 2.0, you cannot reprogram it with new firmware without pulling Boot0 high by jumpering the STM32F405 pin 64 to pin 60 during programming.